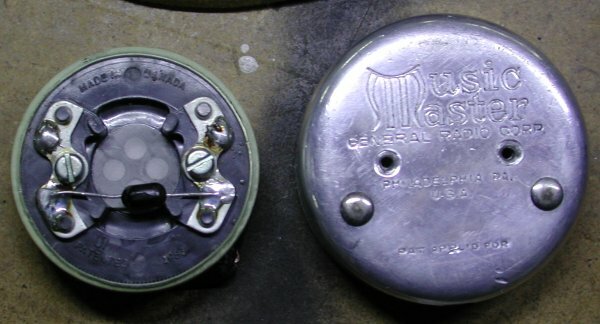 This Music Master horn incorporated a driver made by General Radio, who are now a laboratory electronic test equipment manufacturer (in fact, I have a bridge for measuring resistors, capacitors, and chokes made by GenRad). 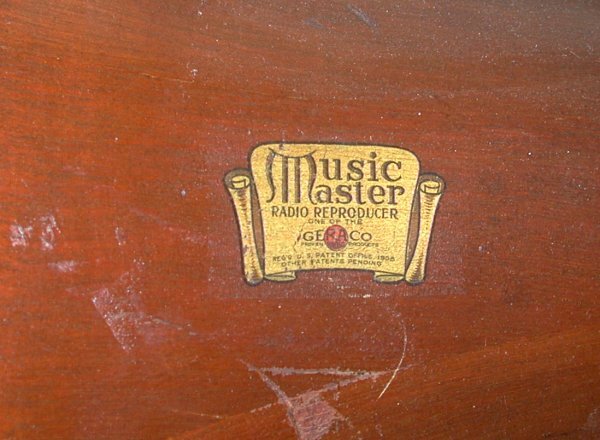 This is probably the oldest speaker I have ever repaired. 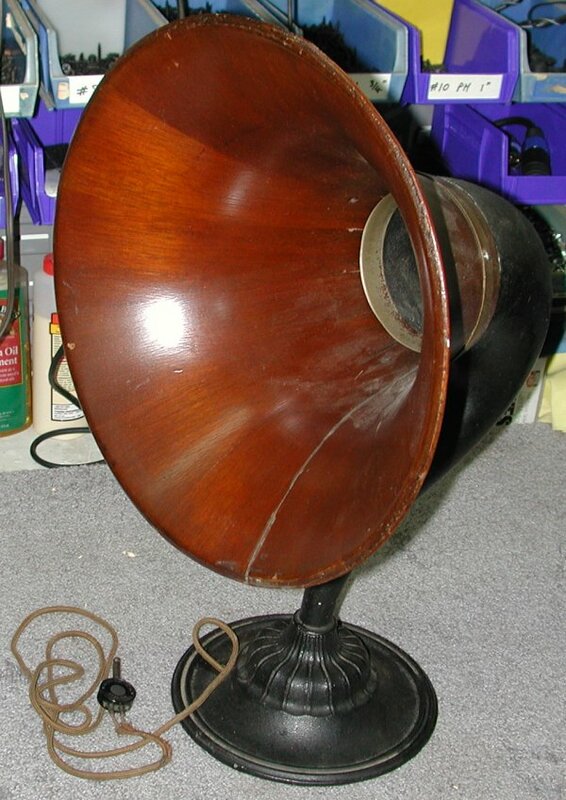 It is a gramophone-type wooden horn on a heavy base, driven by an electrodynamic driver. This was achieved via a pair of electromagnets, driven by the input signal, in close proximity to a fairly stiff (presumably magnetically conductive) diaphragm. 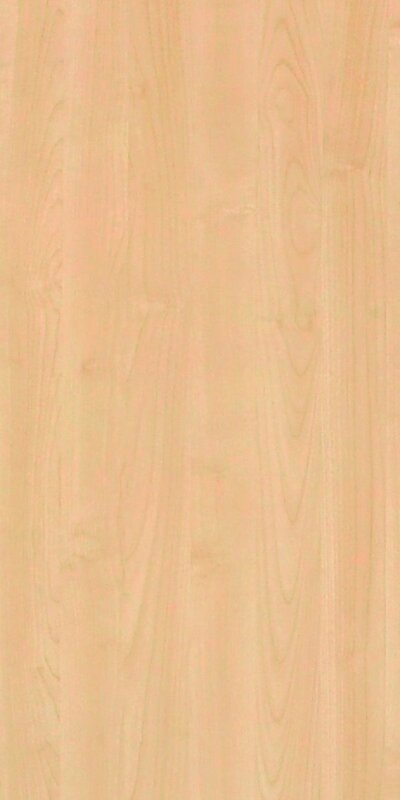 It was in use in a recording studio as an "effect" - they would play a track through this in a soundproof room, and close mike it for its woody, slightly nasal tone. When it was brought to me, unfortunately, it had been overdriven and the dynamic transducer was burnt out. I drilled out the copper rivets holding the cover under the base and tested it with the earpiece of an old telephone from my collection. This worked to the owner's satisfaction, so I proceeded with the installation. 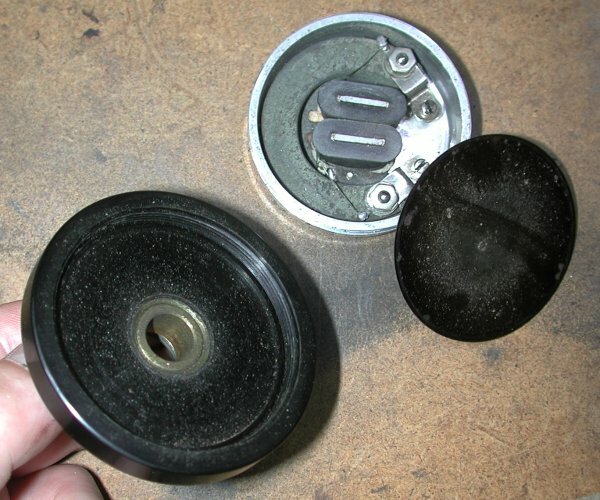 I cleaned up the original cloth-covered cable and reterminated it so it would fit the screws on the telephone "speaker". The "new" driver (patent dated 1953) is held in place with some 3M "Strip-Caulk" so it can be easily replaced or pulled out of the way to experiment with other drivers for new sounds nobody ever heard before. I wanted to drill and tap the cast base so the cover could be bolted back on, but this was not to be - the cast iron was very hard to tap, and it wasn't deep enough to get two or three good threads cut. So I reinstalled it with another ring of Strip-Caulk. This is the badge on the side of the horn. 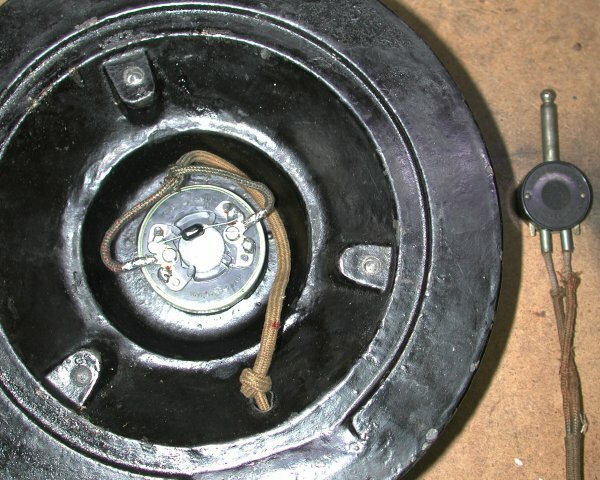 This is the underside of the base, where the driver was mounted. The drive unit disassembled, showing the electromagnets. On the right, the old drive unit, and on the left, the "new" one. Here it is, fully reassembled and ready to create some "tone"!